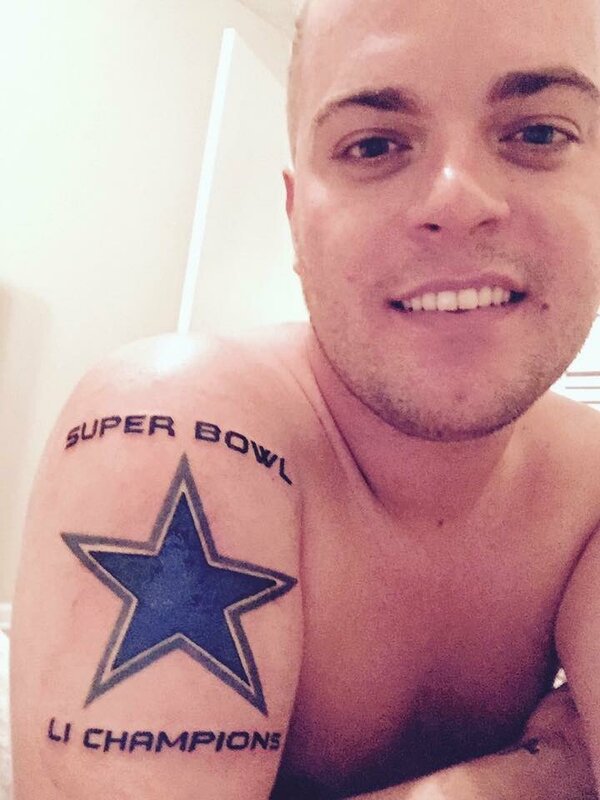 A Florida man is getting heat for prediciting the Cowboys will win the Super Bowl with a tattoo on his arm. BOYNTON BEACH, FL (KTRK) -- Super Bowl LI in Houston is two months away, but fans are already predicting which team will win. One football fan in particular has taken it to another level with his Dallas Cowboys Super Bowl tattoo. Stand-up comedian Jordan Garnett ,24, lives in Florida, and he's been a Cowboys fan since 1999. He said he grew up a Cowboys fan because his dad was one as a child. Now his love for "America's team" is getting him a ton of attention. Garnett got a Cowboys star tattoo with the words, "Super Bowl LI Championship" on his arm on December 6 at the Aces High Boynton shop in Florida, and since then, he says he has been getting death threats with people saying he jinxed the team. "I think it's funny that a 24-year-old chubby comedian who lives with his grandmother apparently jinxed the Cowboys," Garnett said. Garnett said he has always wanted to get a Cowboys Super Bowl tattoo, but he's glad he didn't do it last season after Tony Romo went down with an injury. "I think it's time now," Garnett said. His new fame has his friends a little concerned about being seen in public with him, but he said he's not worried about it. Garnett strongly believes that the Cowboys will make it to the Super Bowl and will play Tom Brady and the New England Patriots. He said he doesn't have plans to come to Houston, but he's hoping maybe, just maybe, the Cowboys would help him out with some tickets after seeing his fan dedication with his tattoo. Cowboys quarterback Dak Prescott has been leading the team after Romo got injured in preseason. Prescott's success has resulted in 11 wins and only one loss for the team.